This page is written by the game's inventor, Joost aan de Brugh. Hexa Decimal is played on a hexagonal board with six hexes on each side. The central hex is non existent. No line movement may leap over this hole. There are ninety hexes on the board. There are six triangular segments, which contain ten hexes each. The grey hexes are the other thirty ones. Both players start with 32 pieces. The initial board setup is highly symmetrical. 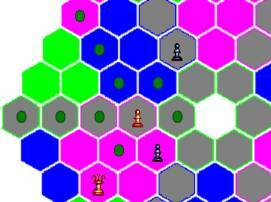 Fifth line: 4 empty hexes - Soldier - Soldier - 4 empty hexes. Pawns are the soul of Hexa Decimal. All pieces have something to do with Pawns. They move any number of hexes in one of the six directions. Pawns can't capture by themselves. Like all line movement, the Pawn movement is blocked by the hole in the middle of the board. The Soldier has two ways to move. It may leap over an unobstructed line of friendly Pawns to the hex directly beyond, possibly capturing an enemy piece. It may not leap empty hexes, or other pieces than friendly Pawns. It may also move one hex in any direction. When doing so, it can only capture when moving directly away from a friendly Pawn. When the Soldier is not moving directly away from a friendly Pawn, the Soldier can move in that direction, but not capture. The Prince moves by orbiting any number of friendly Pawns. This means that a Prince can't move when there is no friendly Pawn adjacent to it. It encircles an adjacent Pawn until it hits a piece, which can be captured if it's an enemy. If the Prince encounters a hex that is also adjacent to another friendly Pawn during one orbit, it can directly orbit the new Pawn and so on. A Prince may move to any hex that can be reached by orbiting friendly Pawns without jumping. Note that a Prince can't leap from one orbit to another when the orbits don't share a hex. 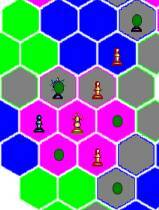 Also note that blocked hexes might be reach via another route. A Disruptor moves one hex in any direction without capturing. It can only capture enemy Pawns. When doing so, it moves at least two hexes in one direction (can be blocked on first hex), until it hits an enemy Pawn. It captures that Pawn by replacement and the whole Pawn cluster is removed. This means that all adjacent enemy Pawns (if any) are also removed. And so are ones that are adjacent to those Pawns and so on. A Disruptor can't capture by moving only one hex and it can't move more than one hex without capturing. A Disruptor can capture up to ten pieces (Ten Pawns when all enemy Pawns are in one cluster). An Elephant moves one hex in any direction without capturing. It may move any number of hexes in one direction until it hits a friendly Pawn. After that, it may continue moving in that direction until it hits a non-Pawn piece. All Pawns in between (friendly and enemy) are removed and eventually the blocking non-Pawn piece if it's an enemy (replacement). It needn't trample until it's blocked, but the first piece trampled must be a friendly Pawn. It may 'trample' empty hexes in front of, between or behind trampled Pawns. An Elephant can capture up to nine pieces, including at least one friendly Pawn. The Guard may move one hex in any direction, but only to capture. It can move any number of hexes in one direction, but only to capture a friendly Pawn by replacement. The Guard can't move without capturing a unit. The Star can move through an adjacent friendly Pawn cluster to any Pawn of that cluster. It captures that Pawn by replacement. Then remove any adjacent enemy piece. The Star does not capture friendly pieces except for the Pawn captured by replacement. A Star can capture up to six pieces, one friendly Pawn and up to five enemy pieces. A Star can't move without capturing. The Wizard moves any number of hexes in any direction without capturing (like a Pawn). When there is a friendly Pawn adjacent to it, it may move the first piece (friendly or enemy) in the opposite direction to the Pawn's position, removing the Pawn. In other words, you may move any piece, friend or enemy, any number of empty hexes, and then have it leap over your Wizard to the hex immediately beyond, which has to capture a friendly Pawn. (The moving piece may not jump over other pieces than your Wizard). Note that when a Wizard causes a move, no piece specific effects are triggered. For example, no adjacent enemy piece is eliminated when a Star uses a Wizard to move. When both ways to move are possible (possible for the Star in the diagram), you may choose whether or not the effect is triggered. The Pawn Master is there to regenerate Pawns. Pawns are used up and captured the whole game. The Pawn Master moves like a Pawn. It produces a Pawn on the hex from where it moved and all hexes passed over. This may not raise your total number of Pawns above ten. This means that the Pawn Master can't move when you have ten Pawns. 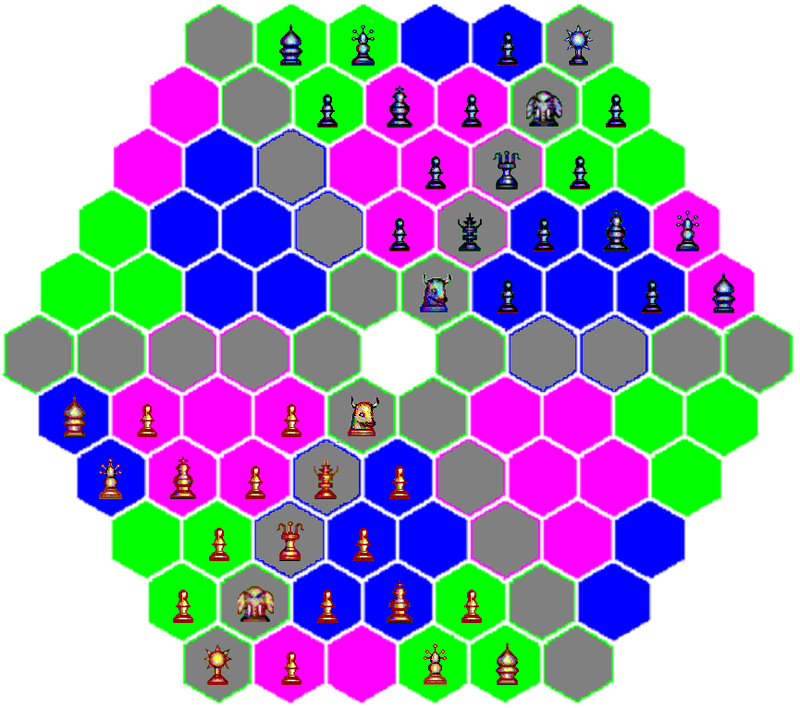 It is limited to three hexes when you have seven Pawns left (see diagram, note that there are no White Pawns on the rest of the board). When the Pawn Master is moved by a Wizard, no Pawns are placed. When captured, the Pawn Master can be regenerated (see King). The King is the royal piece of the game. Checkmating the King wins the game. Stalemate is a draw. Draws can also occur by three-fold repetition or agreement. The King move like a Prince (Pawn orbit). If you've lost your Pawn Master, the Pawn Master is placed on the hex vacated by your next King move. Like Pawn regeneration, this is not optional. But when the King is moved by the Wizard, the Pawn Master won't be placed. There is no move like castling. There are six segments on the board. Three of them are at the White side. Three of them are at the Black side. You can regain lost pieces by invading an enemy segment. White can only invade the segments where the Black pieces start and vice versa. A segment is invaded when the total number of friendly Pawns is greater than the total number of enemy Pawns. 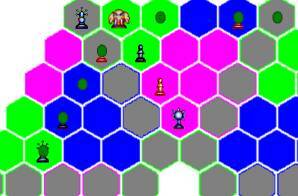 The promotion is executed by removing invading Pawns (friendly Pawns in the invaded segment), and replace your Pawn Master with a lost Soldier, Prince, Disruptor, Elephant, Guard, Star or Wizard. You can't promote when you have no Pawn Master on the board. Promotion costs a move by itself and won't be executed on completion of a Pawn move. The Pawn Master can be regenerated by the King, Pawns can be regenerated by the Pawn Master, and all other pieces can be regenerated by Pawns and the Pawn Master. So this means that you can rebuild your entire army. But if you've lost your Pawn Master and all Pawns, you can't rebuild anymore. No Pawns to promote, no Pawn Master to regenerate Pawns, no Pawns to enable a King move that would regenerate the Pawn Master. Pieces are not too strong. This prevents the game from becoming too fast and tactical. Finely graded values. This makes exchanges more interesting. The area effect logic used in the Zillions implementation. 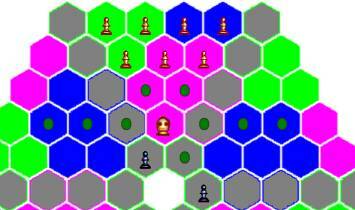 In Caïssa, the area effect checks that all tiles are connected. I used the logic for several things, for example, detecting Pawn clusters. Many pieces have a special power rather than a complex way of movement. Common movements are one hex in any direction or any number of hexes in a direction. Pieces are different because of special ways to capture. Paradoxically, almost every capture is still done by replacement. I used the piece set that Maxima uses for game courier. Only the King is also present in Maxima, but the other pieces are from the same piece set (Available pieces). Both mirror and rotational symmetry. Stalemate is a draw. Draws may be boring, but a draw by stalemate is not boring. A non existent central hex. This restricts line movement. Attack and defend segments. You get a reward when you conquer some territory (promotion). Every piece has something to do with Pawns. So it's important how you distribute the Pawns between attack and defence, one side of the board, the other side of the board, etcetera. Also, you have to find the right balance between Pawns and pieces in an attacking army. Every lost piece can be regained. The game won't be depleted. Hexa Decimal is a game in which the value of pieces substantially depends on the position. So it's important to keep a dynamic position. The starting position is very crowded. You may sacrifice a little material to improve the infrastructure. It's very important to cover your whole army with your Pawns. Without Pawns, most pieces can't capture or become far less dynamic. The King can't even move without a Pawn adjacent to it. Also an important issue is territory. You can rebuild your army when you control an enemy segment. Never leave a segment to your opponent unless you have an advantage elsewhere. Note that promotion is a slow process, because you have to rebuild your Pawn Master. If you strictly focus on promotion, you may get low on Pawns and you might get a very large army that can't act. When the game gets fast, you might put your King on a more central position to speed up the process. The Pawn Master may act more suicidal, because it'll be placed back on a good position. Otherwise, the Pawn Master will create Pawns that are far away. Watch for your King and the adjacent Pawns when doing so. When useful, use pieces like Elephants to get rid of useless Pawns. If your Pawn Master is in a good position, you can get better placed Pawns. In the endgame, keep on reducing your opponent's playing space. Keep on promoting. You can defend your Pawn fence with a few Princes. Use more promoted pieces to further reduce enemy playing space and mate the opponent. Make sure your Pawn Master (of course, also your King) doesn't get trapped behind enemy lines. A Pawn Master and a group of Pawns can't do anything about an army blocking them. A Pawn Master can be immobile when you have ten Pawns on the board and a Wizard can bring him to a place far away. When such a thing happens, be careful of your other Pawns. Attack the blocking army or try to promote. Note that a King can bring back a slain Pawn Master, not a trapped one. There are ten different pieces. Each army has ten Pawns, ten common fighting pieces (4 Princes and 6 Soldiers) and ten special fighting pieces (2 of each kind). The segments have ten hexes each. Hexa Demial is Hexa Decimal with fewer pieces. Each army consist of two Soldiers, two Princes, one Disruptor, one Elephant, one Guard, one Star and one Wizard. There are still ten Pawns, a Pawn Master and a King. This is about one half of the normal army. Both armies start in two segments and the road between them. The remaining two segments start empty. To achieve perfect symmetry, the game starts with two Kings per side and without a Pawn Master. Both Kings are subject to check and mate, but when one King moves, the other becomes the Pawn Master. You may lift a check by changing the checked King into a Pawn Master. Promotion can only take place in the two segments where the enemy army starts. Hexa Threcimal is Hexa Decimal for three players. It uses the same armies as Hexa Demial. The armies occupy two segments each, so all segments are initially occupied. Promotion can take place in any of the four segments initially occupied by the other armies. White starts, Black goes second and Green goes third. The game starts with two Kings for each player and it follows the same rules as Hexa Demial, except for the checkmate and stalemate conditions. A King may be put or left in check. When a King is captured, the player survives until his Pawn Master gets captured. That player may use his Pawn Master to promote to King and resume the game as normal. When the Pawn Master is also captured, that player must remove his army on his next turn and will be removed from the game. A player wins when he owns the only King. When you have two Kings and one gets captured, the other King is can place the Pawn Master with a move and play continues as if nothing has happened. You win when you own the only King. The Zillions implementation plays Hexa Decimal and the variant Hexa Demial. There is also an 'empty board' variant (Hexa Minimal) in which the board is empty except for Kings and Pawn Masters. Furthermore, there is a variant called Pawn Orbit Fight, in which two armies of ten Pawns and a Prince try to checkmate the opponent's Prince. In Pawn Orbit Fight, there is no promotion or regeneration. hexadecimal.zip: zillions of games file and sample game. A Sample game is included. It's a game I played against myself. It's the main variant of the game. The level of play is not very high, but it may clarify the rules. Written by Joost aan de Brugh. Webpage made by Hans Bodlaender. Webpage created: May 7, 2005. Last modified: May 21, 2005. I liked ideas of this game, but how about variant on squares (with same pieces)? I think, it can be made! By the way, same symmetry was used in XQ. This game has a high learning curve, but it seems as though it would be interesting if I could wrap my mind around it. I have played a test game (main variant) against Zillions. I could win after 278 moves, interesting game but really extense, and I think it is not casualty, it is very possible that the game tendence is to last a lot of moves. My opinion is that there are too many pieces, and perhaps the game works better in a slightly smaller board and with less pieces. I have not tried the (included) variant with less pieces, but I am sure the game lenght average is much less in this variant, I´ll try it soon. I haven't thought about notation while creating the game. Zillions' notation is clear. But one might want a more beautiful notation. Position naming: My Zillions file uses a 21x11 grid (a..u by 1..11, lefmost cell is a6, three adjacent cells are b5, c6 and b7, etc). Naming by segments or roads is probably more elegant. The position names should have the same symmetry as the starting position. Piece abbreviations: Zillions uses the whole piece name. It's possible to abbreviate it to a letter and one might even use no letter for a Pawn. To prevent ambiguity, use a T for Star, M for Pawn Master and an R for Prince when using the letter P for Pawn. Triggered effects: A Pawn Master creates Pawns. A King can create a Pawn Master. The Disruptor, Star and Elephant can capture more pieces. Choose whether or not to notate the effect. Promotion move: In Zilions, the promotion move is executed by dragging one invading Pawn to the Pawn Master and choose the piece. The Pawn captures the Pawn Master and becomes the promoted piece and as an extra effect, the other invading Pawns are removed. This creates ugly moves like 'Pawn p5 x r5 x n5 = Disruptor on r5'. A promotion move can be notated by naming the segment and the promoted piece. Wizard move: In Zillions, a move caused by a Wizard is notated like 'PawnMaster g4 x i2', which looks very strange, especially when you move an enemy piece. Notation should indicate that the move is caused by a Wizard. Also a good idea is to notate whether the moved piece is a friendly piece or an enemy piece. Check, mate, stalemate: Can be done like in chess. This looks like an interesting game. Notation should be simple, but I'd like it to have to do with sectors somehow, ie not a whole coordinate system, but somehow sector-square (or road-square) would make it colorful. For initials of pieces I'd say T for star, R for prince, M for pawn master.